Home › News › The True Secrets of Comfort Revealed! 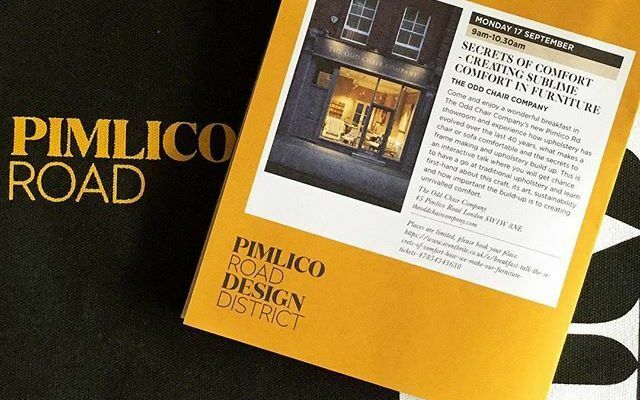 We’re proud to be part of London Design Festival 2018 alongside the Pimlico Road Design District where we will be holding a wonderful breakfast talk in our new Pimlico showroom. Our guests will be able to experience how our upholstery has evolved over the last 40 years, what makes a chair or sofa comfortable and the secrets to our frame making and upholstery build up. This is going to be an interactive talk where our guests will get a chance to have a go at traditional upholstery and learn first-hand about this craft, it’s art, sustainability and how important the build-up is to creating unrivalled comfort. Our design director, James Cook and his wonderful team will be holding our interactive talk on Monday September 17th at 9am – 10:30am and we’d love for you to join us. You can purchase your tickets by clicking here. All ticket sales are being donated to Alder Hey Children’s Hospital in Liverpool to help support their wonderful care and support to poorly children and their families.